Pavel is a graduate of the two-year-long Erasmus Mundus International Master in Russian, Central and East European Studies hosted by the University of Glasgow and the EU Studies at the Jagiellonian University in Krakow, Poland. In 2015, he finished his Bachelor’s degree at the Faculty of Social Sciences, Charles University in Prague. In 2013, he spent his Erasmus study exchange at the University of Kent, United Kingdom. In 2014, he did a study internship at the Faculty of International Relations of St Petersburg State University in Russia. He had several internships in both public and private sectors, e.g. the European Parliament, Ministry of Transport of the Czech Republic, Czech Ministry of Foreign Affairs, or the NGO People in Need. 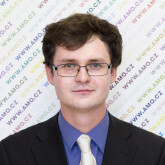 Pavel Havlicek has cooperated with AMO since May 2016.